Sara Lovell’s lastest album, Wild is Everywhere, debuted in April. Filled with 14 original songs written and performed by Lovell, the album perfectly combines a variety of musical genres (pop, funk, jazz, etc.) with Lovell’s clear, beautiful voice and lyrics that range from fun and funny to engaging and heartfelt. I love books. I love music. And I really love books and music when they are joined together. Here are a few newer items that will definitely make you smile. 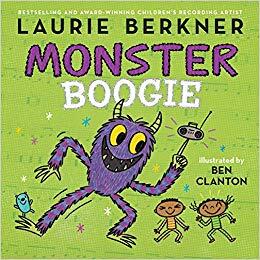 Laurie Berkner’s latest picture book adaptation is for her song, “Monster Boogie.” The song lyrics encouraging children to be the monster and have fun dancing and wiggling are perfectly paired with illustrations by Ben Clanton, who also illustrated Laurie’s last picture book We Are the Dinosaurs. In his lively illustrations, Clanton finds just the right balance between scary and fun that children will enjoy. Monster Boogie is a complete story that can be read all on its own or paired with the song. *A very clever book design allows for the sheet music to be included on the back cover of the book under the book jacket. If you’re not familiar with The Secret Mountain, a publisher based out of Montreal, who specializes in original picture books that are accompanied by full-length music CDs, then you are in for a real treat. A wide variety of authors, illustrators, and musicians from all around the world contribute to this series of books. 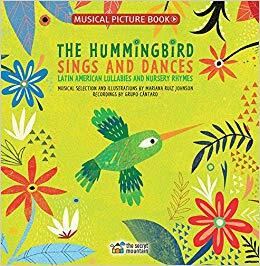 Their latest offering, The Hummingbird Sings and Dances, which is scheduled to be released next month, is completely comprised of lullabies and nursery rhymes from throughout Latin America. Each of the 19 Spanish language songs is given a two page spread that includes beautiful artwork from illustrator Mariana Ruiz Johnson, a note about which country the song comes from, and the lyrics to one of the song’s stanzas in both Spanish and English. The accompanying CD contains all 19 songs performed by the talented Mexico City-based Grupo Cantaro. The full lyrics for all of the songs, in both Spanish and English, are included at the end of the book. Hummingbird Sings and Dances would easily fit into bilingual storytimes and lessons about other cultures. 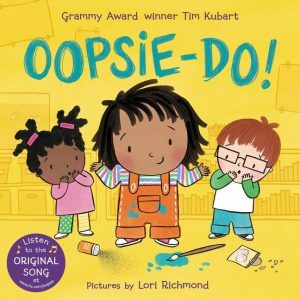 GRAMMY Award winner Tim Kubart released his first picture book in May. Oopsie-Do! is a delightful story about a young girl who rather than fretting when things go wrong proclaims, “Oopsie-Do!” and with the help of her friends and the grown-ups in her life work to make the things going wrong, go right. Lori Richmond’s charming illustrations include a diverse cast of characters that embody all of the ups and downs that the children go through in a day. This is a great storytime book as well as a good title to share one-on-one. Pair this with Tim’s adorable full-length video for the song version of Oopsie-Do! While each of these titles is completely different, they would all be right at home in any collection. 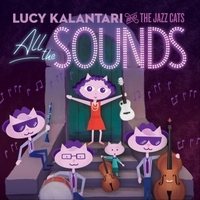 My introduction to Lucy Kalantari’s special brand of family jazz music was her fall 2017 holiday EP It’s the Holidays! and I’m so glad that she’s back with this full length album. This jazz age inspired collection of ten original songs is a real delight. Each song has its own unique identity filled with complex melodies and engaging lyrics, yet they all fit together to make a beautiful whole. Once again Kalantari is backed by the highly talented Jazz Cats who really get to shine on numbers like “Ain’t No Dog Like Mister,” a tribute to Billie Holiday’s dog Mister which allows for some great clarinet solos as well as the tango accented “Howl to the Moon” which opens with a gorgeous cello solo that leads to vocals backed by a swaying bass beat as it tells the story of a werewolf who longs for the evening when he can dance with his friends. Songwriting really takes the spotlight when Kalantari skillfully weaves other musical genres into her tunes. The quick paced “Are You Afraid of the Dark?” features an original rap by Secret Agent 23 Skidoo wrapped in a jazz number that emphasizes the importance of understanding your fears and asking listeners “Can you turn that bad into something good?” Another fun blend of musical genres occurs in “Bunny Hop” where the main character in the song gets to know Mr. Opera Man (real life opera singer Adelmo Guidarelli), the next door neighbor, who operatically proclaims, “I love bunnies!” Listeners will quickly find themselves hopping and thumping along to this tune. While all of these songs are great for family listening, there are also several that would be nice additions to a storytime, program, or classroom lesson. “I Know a Little Fellow” could work to introduce children to musical terms as Kalantari’s talented 5 1/2-year-old son demonstrates on the cello the terms she sings about such as pluck, bow, pizzicato, pianissimo, and fortissimo. “La Cosecha” is a fun bilingual song that would fit nicely into a storytime about gardening or community that introduces listeners to a wide variety of vegetables in both English and Spanish. Finally, “The Peace Song” is a lovely call and response song with a special message. All the Sounds is a joy from beginning to end. Families will find themselves listening to it again and again. Frances England is back! It’s been two years since England released her GRAMMY nominated album Explorer of the World and clearly that two years was time well spent. 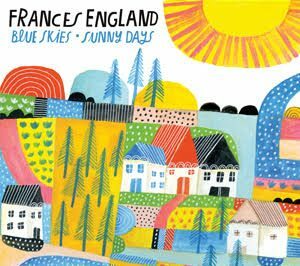 With her new album, Blue Skies and Sunny Days, England presents a collection of songs that are breezy and light while conveying a message of positivity and love. Listen to “Not Just My Sister” in its entirety below. Blue Skies and Sunny Days will be out on August 14. In the public library realm of program planning, there are two seasons of programming – all of the programs that we do during the school year, and all the programs we do during summer reading. As our summer reading programs are winding down, I thought it was a good time to turn our attention specifically to storytimes. Many libraries do continuous storytimes, never taking a break (my hat is off to you, that takes a special level of energy and enthusiasm) while others take occasional breaks (often in August, December, and May) for program planning and rejuvenation. No matter where you are in the planning process, here are two new albums featuring songs perfect for use during storytimes. The first album is Moving to the ABCs from Kansas-based Jammin’ Randy. Clocking in at almost 75 minutes, this album features 26 songs – one for each letter of the alphabet – with titles ranging from “Awesome Alphabet Rap” to “Zany Zebra.” Jammin’ Randy performs this collection of all original songs with just his solo voice set against simple melodies that children will find easy to follow along with. Many of the songs encourage participation either through movement or echo/repeat in the lyrics. Clear instructions to perform various actions like stomp, clap, hop, jump and count to four are given on songs such as “Clap Your Hands,” “Penguin Hop,” “Wiggle Wiggle Waggle,” and the “Egg Shaker Dance.” Additional movements include move to the front, the back, the left, and the right. All movements are developmentally appropriate for the target age group and are set at a pace that most preschoolers will be able to follow with little difficulty. 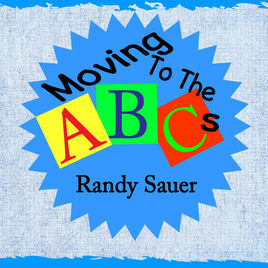 Jammin’ Randy, or Randy Sauer as he is known in his every day life, let’s his experience as a K-6 music teacher shine in the lesson plans that he provides for this album. 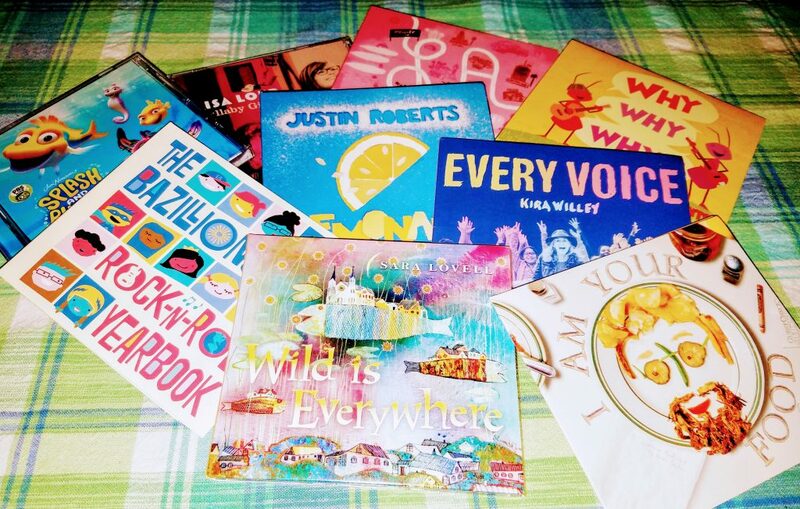 For each song, he provides suggested art, music and physical education activities making the songs easy to incorporate into the storytime planning process. For more information, or to check out the lesson plans, visit www.jamminrandy.com. The second album is from Chicagoland-based Jeanie B! Jeanie B! & the Jelly Beans released the album I Love Music this year, but it is Jeanie B!’s solo album, Come Together that I would like to highlight. This album is split into two parts. The first part is “Come Together Songs” and the second, “Classroom Transitional Songs.” Thirteen of the fourteen songs in the first part are Jeanie B! originals. It is clear that she knows her audience because the songs all range in length from 1 to 2.5 minutes, making them perfect for storytimes. Several of the tracks are beautiful songs about nature that are just lovely to listen to, including “How Do You Build a Nest” and “I’m a Little Butterfly.” The rest of the tracks in this section of the album are very interactive including “If I Was An Ant” which gets kids snapping, clapping, and stomping, “Marching On My Feet” which highlights various body parts and “5 Little Pieces of Bubble Gum” which gets kids counting down from five to none. Additional songs include “Mary Had a Little Farm” during which children are encouraged to make the sounds of a variety of animals and “Zim Zamma Zoom” a fun call and response tune. 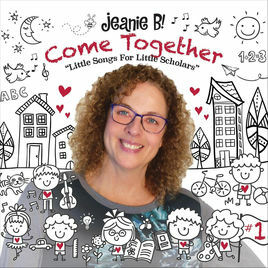 The second part of the album would work best in a preschool environment with song breaks averaging around 30 seconds and covering topics from “Time To Wash Hands” to “Snack Time” and “Right Hand On The Rail.” Jeanie B!’s live shows are always a lot of fun and a real hit with the preschool set. If you find her performing in your area, make sure to check it out. For more information about Jeanie B! and all of her music, visit www.jeaniebmusic.com. 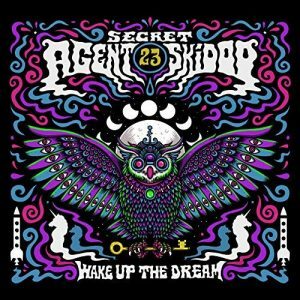 Secret Agent 23 Skidoo is back! This Amazon Original album, 23 Skidoo’s first full length venture since the GRAMMY winning Infinity Plus One, is set during a show on WREM Dreamtime Radio where all-original hip hop, R&B, funk and soul tunes are played. Each song on this album has its own unique style and flair yet they all work together united by the same theme of exploring your dreams and imagination. Things kick off with the totally funkadelic title track which urges listeners, “Life can be what you want it to be, you gotta dream it first then wake it up.” This tune is quickly followed by the haunting “Where Did the Magic Go,” which is a song about a dragon and a unicorn discussing the loss of magic because of so much screen time but is set to a gorgeous, haunting 1960s melody that would fit right in playing in the background at Pop’s ChockLit Shoppe (yes, that’s a Riverdale reference!). Several additional songs including “Dreaming Again” and “Broken Dreams” would also be right at home spinning on the jukebox. The lead vocals and instrumentations by a whole host of guest artists are just out of this world. 23 Skidoo’s vocal rhymes are on full display on “Makeshift Spaceship” and on the hip hop version of the Chinese folk tale, “The Stonecutter,” while “You Caught My Eye” brings back the character Pickles the Pirate who tells in true pirate fashion his tale of falling in love with his wife the mermaid. All of the songs feature incredibly well-crafted lyrics, but it is “Black & White Squares” that has the greatest impact, using the imagery of a chess board to illustrate the issues facing society and how we can change the rules. This entire album is powerful, yet totally fun to listen to. And that’s the Secret Agent 23 Skidoo way. 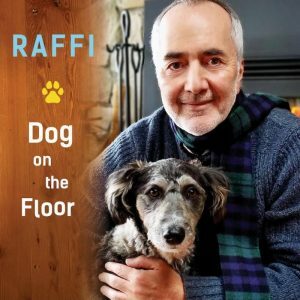 Families with older children will love this album. It’s smart, filled with complex melodies and sounds like something kids might hear on the “grown-up” radio stations. And grown ups, be prepared, there’s a very good chance you’ll be listening to this even when the kids aren’t around! 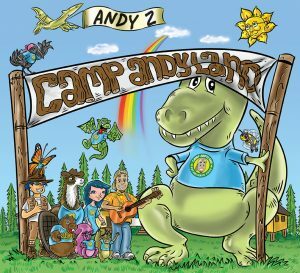 Just before the July 4th holiday I reviewed Andy Z’s new album, Camp Andyland. Now, just a little over a week later comes a brand new video for “Camping Song,” the seventh track on the album. This video features live versions of Andy Z. (with guitar) and two teen campers inside the animated world of Camp Andyland. Throughout the song, especially during the chorus, the campers do movements that go along with the lyrics to create interactive moments for the viewers. Well-executed, animated characters from Camp Andyland seamlessly interact with Andy and the campers adding to the overall whimsical feel. This video for “Camping Song” is the perfect complement to the upbeat fun of the track. Enjoy (but watch out for those banana slugs)! Summer is the time of year when kids start heading off to camp. For some it’s overnight camp, for some day camp, and for others camp for just a weekend. 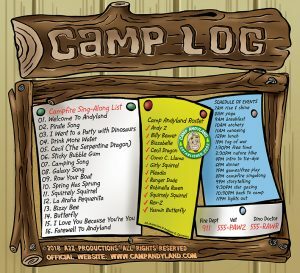 For those hanging out at home this summer, there’s a new fictional camp filled with musical adventures just waiting for them. 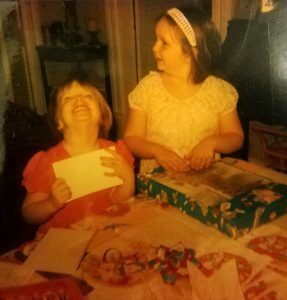 Camp Andyland is a true joy from beginning to end. And speaking of end, I love that Andy Z carried the theme of the album all the way through to the details on the back of the CD packaging, including not just a song list, but a Camp Andyland Roster , a schedule of the day’s events while at camp and even emergency numbers for the Vet (555-PAWZ) and the Dino Doctor (555-RAWR). It’s that time of year when families are packing up their SUVs and heading to destinations near and far. Whether you’re driving a couple of towns over to go camping or taking that long road trip to Disney World, this playlist, put together by the folks at Sugar Mountain PR, is the perfect accompaniment to any car ride. Filled with fresh new singles as well as some favorites from 2017, this summer-centric playlist is filled with fun road trip tunes. Sit back, relax, and enjoy the ride!